WHY IS A SOCIAL STRATEGY A NECESSITY FOR START-UPS? According to We Are Social, there are 2.8 billion global social media users in 2017. Facebook says that more than 50 million small businesses are using Facebook Pages to connect with customers. In 2015, Facebook influenced 52% of consumers’ online and offline purchases. Owing to their word-of-mouth nature, social media platforms like Facebook are informing consumer decisions and this affects not only large companies but also small businesses and start-ups. The Ambassador revealed that 71% of consumers who have a good social media service experience with a brand are likely to recommend it to other people. The old adage of go to where your customers are rings very true with social media. Your potential customers are on social media platforms, whether your business is or not. Having a social media presence is now a requirement more than a fleeting trend. Being active on social, allows you to manage and respond to what customers are saying about your brand, product and services. For start-ups, correctly utilising social media platforms can be the difference between success and failure in the online space, which is even truer when it comes to customer service. To deliver a high level of customer service, an understanding of how to manage social media platforms effectively is necessary, and this should be informed by a solid and robust social media strategy. Define your goals and objectives and how social media platforms can help you achieve these. These goals or objectives must be SMART. These goals should be very specific and you should have a way in which to measure them. Make sure your goals are achievable so that you do not thwart your own efforts. Goals should be relevant to the business strategy at large and should be time-based, so you know when to stop and take stock of your performance. When defining your SMART goals, recruit new team members from your employee base to be involved with defining the goals as you get an all-round perspective of what is important for your business in terms of goals. You need to get buy-in from your whole team so include them in the process of creating your social media strategy. When you set SMART goals that everyone agrees on you can easily measure whether you are meeting expectations and improving your companies marketing performance. Remember to specify the social media measurements you are going to utilise for measuring success. Are you aiming for a high click-through rate (clicks to your website), impressions (how many people see your social posts) or conversions (how many people are completing a predetermined goal on your website)? Select the right social media networks that fit your audience demographic. Look into your website analytics and see which social platforms your website visitors are originating from. Learn what social media networks your existing customers are using. Each social media platform has its own audience and tailors to different needs. For example, LinkedIn is a social network for business professionals while Facebook has a broader audience demographic across all age groups. Another good step is to do a social media audit and identify who of your audience is currently connecting with you on social platforms. This assists you in identifying which social networks your audience is making use of. From there, you can pick the relevant social media profiles you need to create. Choose social networks that will help you to meet your goals, and build and refine them in the process. Also look at what your competitors are doing and get inspiration from industry leaders. Benchmark your social performance against competitors to see how you measure up. Your plan of action will always be changing as you test, evaluate and adjust your social media marketing strategy. The next step is to produce great content for the social media platforms you have selected. Engaging content is vital for being successful in the social space. Creating a content marketing plan and social calendar is a necessity. Define what your start-up’s voice and overall messaging are for social media. On top of which, you should also identify your buyer personas, based on audience research you conduct, and tailor your messaging to speak to your personas at each stage of the buyer’s journey. Once you decide on your brand voice and tailor messaging to your selected personas, you can start creating valuable, reliable, relevant and consistent content that will help to attract your target audience. This content can range from infographics, eBooks, Whitepapers to videos, blog posts, and podcasts. It all depends on your business, as well as the products and the services you offer. Examine what kind of content your competitors are creating, what industry events speak to your target audience and what type of content (video, images, etc) appeals to your audience. 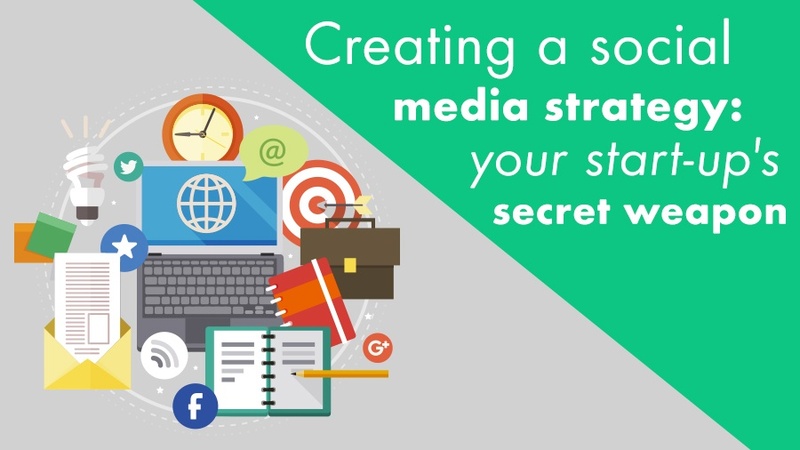 Then start creating and developing new content to share on your social profiles. However, keep in mind, that every social platform is different, with varied character limits, image size requirements and so forth. Track, evaluate and measure what works for you on social. Identify successes and failures, and start to develop your own best practices and guidelines, which can be added to your social media strategy. Your social media strategy is a living, breathing document, and should be constantly evolving. Lay out how you are going to build a community of brand ambassadors for your start-up. Search for social media influencers that line up with your vision. You can turn these social media influencers into brand ambassadors. Social media influencers are online tastemakers who can help your product or service reach niche audience demographics. They tend to have more followers than you and the support of a community of engaged fans. Join groups on Facebook and LinkedIn, and make use of hashtags when posting new social content. Join communities on social networks and share relevant content across all these channels. Make a concerted effort to be active on social platforms and be responsive to the queries of your customers. This goes a long way in increasing customer retention. Take on feedback, criticism, and suggestions from your audience and strive to improve your relationship with customers via your social profiles. All of your best practices, learnings, and guidelines should be documented in your social media strategy document for future reference. As a start-up, when you step into the world of social media marketing, you will probably have a limited budget for social media. Navigating the word of paid advertising, especially social media, can be somewhat tricky. Our advice is to first consider what all your costs are going to be in terms of content creation and social media management. Think about how much it will cost you to get images produced, the cost of creating engaging content like eBooks, writing blog post content and the costs related to managing your social platforms, and the cost of software licences. Explore all your options for promoting your social content and find out what your most affordable and effective options are. For example, while LinkedIn paid advertising may be too expensive because of the high cost-per-click (CPC); Facebook may be cheaper by comparison. Develop a marketing budget in a spreadsheet and record your predicted costs, and assign suggested spends. Document your active spending in this spreadsheet and try to prevent underspending and overspending by tracking your costs every day. Your start-up may be in the early stages of growth but there are lots of organic, effective and affordable ways to reach your target audience on social and grow your online customer base. Social media is a helpful tool for not only connecting with friends but is vital for business development and marketing. With the above recommendations for creating a social media strategy, you will be able to sustain your brand’s image and gain exposure and reach on your chosen social media channels.